These vines were given to her by a grower, it is pretty common in the French countryside to use uprooted vines as heating wood and for this lady with meager means this was pretty useful as she heats her house with a cook woodstove. Her son was going to cut this wood so that she could use it proprely. What spiked my interest is first that the vines still had all their root system, and this was very interesting to watch the spread of roots in old vines that were intially farmed correctly with regular plowing and no herbicides/fertilizers. The woman told me that according to the grower they were 60 years old, that is, they were planted well before the time when easy conventional farming brought drastic changes in the root architecture and ultimately in the yields and quality of the grapes. Even if this vineyard was later sprayed with weedkillers and boosted with fertlizers, it still retained it's original web of major roots which was a useful indicator for me. It had been for me an eye-opening experience to compare the two rooting systems during a visit a year ago at Georges Laval in Champagne (pic on right) : Georges keeps in his cellar the two types of vines hanging next to each other, the one that has been well-tended from the start with plowings and no fertlizers and the other one which has herbicides instead of plowings to handle the weeds and got regular inputs of fertilizers. On this picture (on right) you can see that the herbicide-sprayed, fertlizers-assisted vine on left has a completely-flat root system, the few roots that seem to go down actually do so now because of their weight, orginally they were all flat, adhering to the surface. There's no way this vine could have reflected a particular terroir or struggled hard enough to yield quality grapes. These kind of issues should be debated and taught in the enology and viticulture programs of all wine schools (with the subtitle : what sort of wine do you want to make ?) but I'm afraid it's not. What struck me first while looking at this pile of vines is that in all of them the vinestock first dives straight into the ground about 20 centimeters like you can see on this picture, before beginning to spread its root system open, many of the roots going down verticalmly. While I have often seen such piles of uprooted vines near farms and country houses as heating wood, it is pretty rare that the grower has left the roots in place. When a vineyard is not plowed from the very planting and gets its nutrients through fertlizers and irrigation, its rooting system will be mostly flat, adhering as much as possible to the surface to be as close as possible to its life-support assistance. The yields will be much higher of course, which is also why commercial wineries do that, the other reason being to spare money (scratching the ground or plowing regularly is time consuming and costly). But I was to get more surprises and unexpected info on why these vines were uprooted in the first place. Like I wrote above, this elderly retiree is absolutely not into the wine issues and not into the organic-farming narrative with which we're familiar, she just grows her vegetables and keeps her farm animals free of chemicals by instinct and love for mother nature, and probably also because she has meager resources and it is economically sound to do things naturally. As I was looking at the vines and explaining to her that old vines have deeper roots because of early plowings, she recounted me that the grower (who sells his grapes to the local coopérative) told her he didn't want to uproot this old vineyard but he was paid money to do that and that the vines he would replant at its place would be giving plenty of grapes in only two years. Now that's intertesting, she didn't fully understand why this grower reluctantly uprooted his vineyard and was paid by the authorities to do that, but I did : this pile of old and otherwise-healthy vines in front of me are the direct consequence of French and European subsidies given to the growers who uproot their old parcels or varietals deemed unwanted by the wine administration and replant in the place clones of Sauvignon or another international varietal. 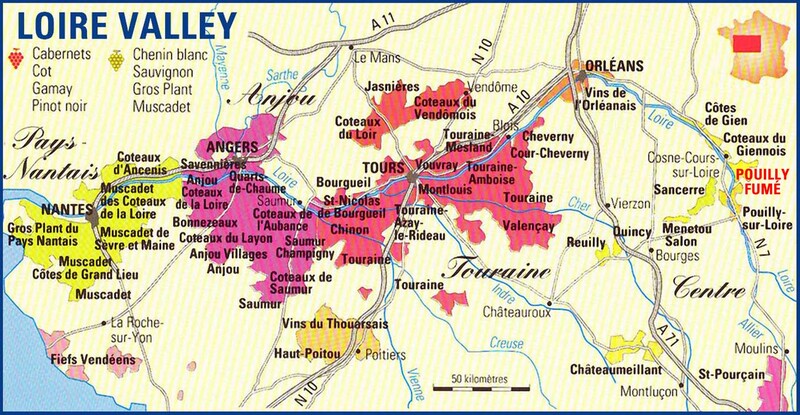 In this very region of Touraine I learnt from Olivier Bellanger last summer that these subsidies amount to 12 000 € per hectare, considering you replant clones of the varietal encouraged by the administration (like sauvignon). The replanted vines have to be clones otherwise you don't get the money, don't laugh, that is the state of things today, while all the artisan winegrowers I meet complain that they can't purchase or rent these old vineyards because the growers get so much money to just destroy all this viticulture heritage and plant high-yield junk instead. These primes d'arrachage (uprooting subsidies) are indeed doing a lot af damage across France and also in other wine regions of Europe. This mindless and shortsighted policy is officially motivated as a way to counter wine overproduction, but the result is that the uprooted parcels are often the one that are old with low yields (the qualitative ones, in short) and the replanting vineyards will be uninteresting clones of generic varietals, which means that the overall quality of the wine pruction will be lowered. If you read French (but you can google-translate that) here is an interesting piece by an insider (the woman who wrote that is herself a winegrower in the Languedoc) on this issue of these uprooting subsidies. First we learn that it costs huge amounts of money to the taxpayer (when you know that the end result is to erase valuable old parcels it's even harder to swallow) : back in 2008 there had been 175000 hectares uprooted throughout Europe (22700 in France) over the course of 3 years for a cost of 464 millions euros just for 2008. In her piece she linked to a European document overlooking the issue of subsidies and production control. You can read this document here, another informative thing showing how European and French bureaucracies want to regulate everything in the wineries, thinking their kafkaiesque convolutions and spending will miraculously better the quality of wines. Just try to read a few pages of this text and you'll understand how disconnected there European bureaucrats are from the reality on the ground. The subsidies were managed and distributed at the time in 2008 by an obscure administration named Viniflhor and since 2009 it is managed by FranceAgriMer, the French administration in charge of overlooknig agriculture and fisheries. Catherine Bernard who wrote this piece recounts how she herself couldn't find a way to purchase and old parcel of Syrah in the Corbières to a winegrower who was to retire soon. She says it was a rare parcel, located in a wild canyon with schists undersoils, the Syrah vines were trained in goblet like they used to be around Condrieu from which they came here. The grower uprooted the whole thing, for the alleged reason that vines had made his whole life difficult. More recently she was refused the purchase of a 30-are parcel of Carignan which had low yields of 20 hectoliters/hectare, because the owner wouldn't let it go under 6000 €, the equivalent of the subsidies he'd get with the uprooting and a later replanting. Welfare money is indeed destroying valuable parcels and although it has been going on for years, the administration is not aware of the problem. If you browse down this other administrative document by the French Ministry of Agriculture and go down to the page 23 (or 6/26) you can find interesting informations on the amount of the diverse subsidies a grower can reap for different actions on the same hectare, and one of these is oddly irrigation, meaning that while the usual narrative is that Irrigation is forbidden in France, it is actually condoned and even encouraged with subsidies. The amounts keep changing along the years and for 2012/2013 they could reach a maximum of 8800 € per hectare as detailed page 23 including 800 € for the installation of an irrigation system. Languedoc is interesting to study when thinking to uprooting subsidies because it is the region that got such a large surface of vineyards erased over the years, but what you read on these great parcels being uprooted by growers to survive could be depicting growers from other regions as well. When you sell your grapes to the coop or the négoce, you're paid by the volume and not by the quality of your grapes, growers often struggle to make ends meet as the money they get for their grapes is low and their operating costs are dangerously close. Yet, the consumer could make this change if he wasn't chasing the lowest bottle price in the supermarkets. Like this post [in French] rightly points out, we all need to buy the wines of these vignerons who keep working with varietals despised by the administration, like in the matter Carignan for the Languedoc. For the information, the administration encourages warmly (and with our tax money) the plantation of syrah, viognier and merlot because in the mind of the wine authorities these are varietals that fare well on the international market. In short, the same writer says, resist and buy the wines of Barral, Gauby, Olivier Jullien, Pierre Quinonero, Maxime Magnon, Cyril Fhal, Izarn, Jérôme Bertrand, Alain Chabanon and Pierre Clavel. I still think that the move to quality wine would be more efficient without these counterproductive welfare subsidies, and encouraging growers to vinify and bottle their old parcels would be rewarding for everybody. The writer marvels at the nice old Carignan vines on this small parcel shown in the picture, but he says he's not sure these vines are still in place as he wrote this piece. It takes also a lot of self-sacrifice to growers who listen to their instinct and delay the uprooting of these parcels in spite of their low yields : if they're selling the grapes to a coop (other than the one at Estézargues) there's little chance they get paid according to the quality and low yields. Of course don't expect anything to change on this issue in spite of this late realization, subsidies will remain in place and old vines will keep being erased. Very interesting article. But also remember that these vines are planted on grafted (phylloxera-resistant) rootstock and different rootstock have different growth patterns quite naturally. For example rootstock derived from Vitis riparia are naturally shallow-rooted and in the wild this species flourishes in fertile soil and in areas with high water tables, river banks etc. Rootstocks derived from Vitis rupestris, on the other hand, normally root very deeply and in the wild they flourish in areas where soil is low in nutrients. These vitis species have evolved to suit their environment and form their roots accordingly. They also differ in their affect on vine vigour, resistance to disease and nutrient take-up in a complicated interaction with the soil. Vine growers use them as rootstock and (should) make their choice of rootstock based on a study of the above. Sometimes a vine grower will use different types of rootstock in the same vineyard, just as (say) a grower of Pinot Noir will grow several different strains in the same vineyard as an 'insurance policy' against disease, or to spread out the harvest dates, or to gain complexity in the wine. So it is possible to see both types of rootstock perhaps in the same vineyard for various reasons. Excellent post! The race to the bottom - greed! Will backfire for them! But in the process, national treasures will be lost! Here in Washington State we are just beginning to reap the benefits of vineyards with age, cared for naturally, having some character, having something to say! I hope we continue to listen to your warnings and protect our own treasures! Very good point Mike, I left the issue of the different types of rootstocks on the side, and they count so much in the way the vine will behave. Growers who are trying to improve their vineyard have often told me that they favored rootstocks that were less productive, they has less volume of grapes but of better quality. Hi, I've been doing a little research (I mean a little) on vine roots, and I think I have at least one or two alternate explanations for your horizontal verse vertical root growth. First, cultivated clonal selections have a more highly divided rootsystem than no grafted vines which have a tap root that goes down vertically like the vine on the right - but are prone to phylloxera. The clonal selections have a "main framework roots" that goes down no more than 13 or so inches and can grow very thick. From these, the permanent root system grows, quite horizontally with it's spreaders, typically 4-6 feet from the trunk, but have been known to grow 30 feet away if necessary, but also sends down 'sinkers'. From the permanent roots grow the absorbing roots, which continually are grown and die off (like hairs on your head) gaining the nutrients the vine needs for growth. These all exist in the first 80 cm (around 2.5 feet). Thank you very much for this contribution, this sheds light of another explanation for these roots shaping, I had also thought in a corner of my mind that indeed rootstock could play a role, as different rootstocks may behave differently in their rooting structure. If given the opportunity I'll ask the grower if he knows about the clone/rootstock type of these two vines. I won't comment on the politics of this article, but the comments on root structure were interesting. I think there is a lot of presumption being made, and the two vines hung on the wall prove nothing. However, the suggestion that fertilizer and irrigation influence root architecture, and that this can have qualitative impacts on the fruit produced, have some validity. I did a lot of field research on drip irrigation of many different crops before I retired a few years ago. It became very obvious that roots move toward resources. But it also became obvious that roots will have innate behaviours, based on their genetic background, which with grape rootstocks can be very complicated. And it needs to be acknowledged here that very few European grapes are grown on their own roots. Phylloxera makes that untenable, and has for over 100 years. So the result of management practices, such as fertilization and irrigation, is that they can influence root system development, but cannot completely dictate root system architecture. Of course, there is also the role of soil profile and character. I'm familiar with wild vines (Vitis aestivalis, var. bicolor) growing on bluff tops and sides that must have roots stretching deep into bedrock like conditions. I'm familiar with wild vines (Vitis riparia) that are growing on river banks that must cope with high water tables. Grapes have tremendous capacity to adapt in the wild. Commercial viticulture does many things that exert influence over the vines, some purposefully, some through neglect. Its hard to see the roots of vines until you pull them out. Good growers have good imaginations and abilities to understand what their vines are saying to them. Commercial viticulture is not for the weak-hearted or weak-minded. Growers who love their vines have the best chance of success.